After moving Kate down the hall to her new “big girl” room, and with no plans for Baby #2 in sight, we decided to turn Kate’s nursery into an upstairs playroom! 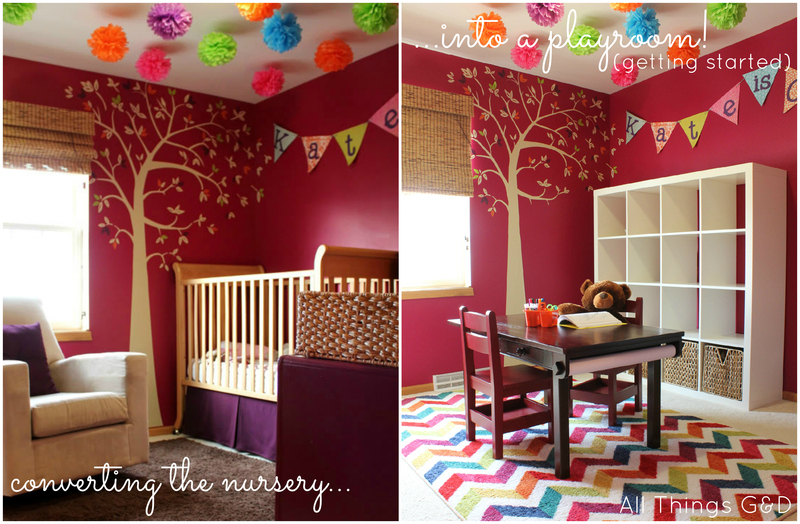 After all the work I put into creating Kate’s colorful tree on the wall, I wasn’t ready to take it down – which also meant I’d be keeping the room’s magenta wall color. In addition to keeping the tree, I also knew I wanted to work Kate’s activity table into the space. We originally bought it for our downstairs family room (table seen here), and at the time red chairs looked the best. I’m no expert on the color wheel, but the way I see it red and magenta aren’t exactly best friends. With plans to incorporate plenty of other fun colors into the space (orange, purple, lime green, and teal), I had a feeling I could make it all work without having to repaint the chairs…as long as I could find the perfect rug. Looks are important, but I also need my area rugs to be soft and durable. We’ve been living with this rug (and playing on it) for almost two months so far and it looks and feels fabulous. It’s nice and soft under our bare feet, low-pile so Kate’s tiniest toy pieces don’t get lost in it, and it vacuums up beautifully. The best part? Mohawk rugs are still made in America! So far Kate’s new playroom includes our gorgeous new chevron rug, Kate’s activity table, a new IKEA Expedit shelving unit which will soon be filled with toys and crafts, and her play kitchen set (not seen in the picture above). I still have a loooong way to go in here, but I’m so excited with how it’s starting out! Interested in snagging a new Mohawk area rug to begin transforming a room in your house? You’ve come to the right blog! 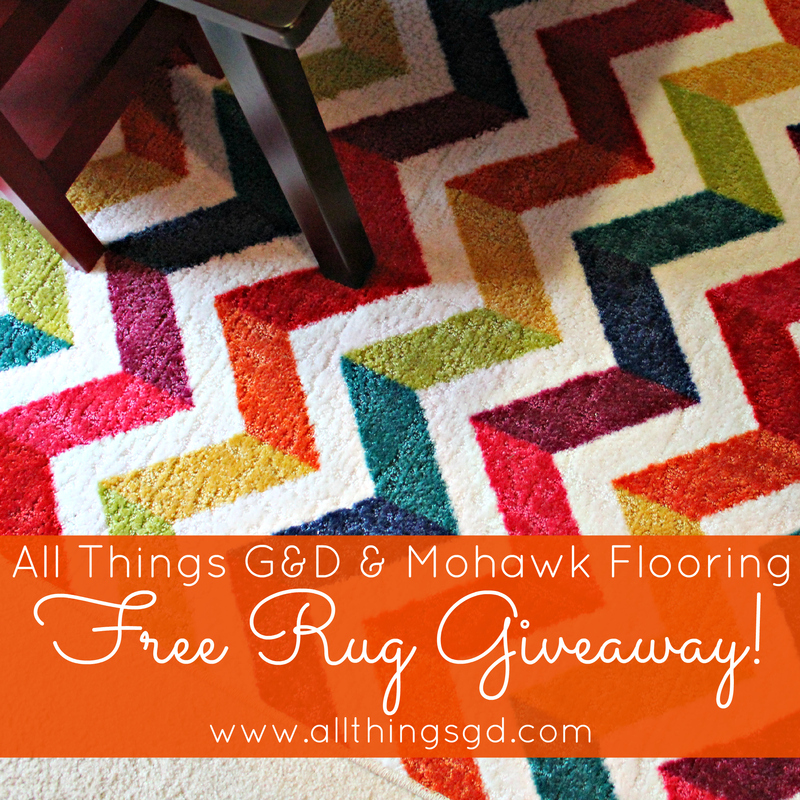 One lucky All Things G&D reader will win a Mohawk Home rug (up to 5×8 in size and under $150) of their choice! To enter, simply use the Rafflecopter widget below to enter up to ten times between now and the end of May for your chance to win! Disclosure: I received this Mohawk rug to review at no cost to me. All opinions are my own. The zig zag stripe teal! I think the colorful chevron you used would make a great starting point for my daughter’s big girl room. Really like the cream medallion. I love the zigzag one you put in Katie’s room. Sooo cheerful and colorful. There are way too many to choose from!! The Bangles Multi would be perfect for our new baby’s room – but I love all the Big Bear rugs too, especially the sea foam! Love love love the Lascala Chevron Stripe Blue!! Would look awesome with our kitchen redo under our kitchen table!! I love the Swirlz Yellow rug! I would love the mixed chevron you used in Kate’s play room!! It would look awesome in my daughter’s room!!!! Love the Bangles in Multi! I like the Everyday Life Black Pebble rug. I love the Peacock Floral! Um, I’m not even going to TRY not to want Kate’s rug. I’d choose that in a hot minute for Olivia’s playroom!! I love your selection for a kid’s room – so bright and cheerful. The simpatico rug would be great in my living room! The Lascala Chevron Stripe Blue is calling my name! I like the Frise Shag in Crimson. I love the Bangles in Multi!! So pretty! I like the Anton Natural! I LOVE the Lascala Chevron Stripe Black/White! I love the Orlando Camel rug! The Simpatico rug would go great in my house! I like the one you used! I also like the one you used! I love the Anton natural! I am working on my kids playroom right now! I would pick the exact one you have! Love rainbow and chevron! Any Chevron rug for our living room! Mixed Chevrons in my living room for sure! I need to add some color to my earthtones. The Wilshire would look great in my new living room! I think the Cream Medallion runner is my fave – but so many to choose from! I like the Alcott Oyster rug. One of my favorites is the abacus smoke blue,but if i ever got to actually get one I would have a hard decision since they have so many beautiful ones. I really like your chevron rug, I love bright colors! I love the Alcott area rug in Oyster. Thanks for a great giveaway! I am totally in love with the rug you put in Kate’s playroom. The endless colors and chevron print speak to me!! I would pick the Seagrass Square door mat! I like Embers in Khaki. I like the Angela in rainbow! The Charm Multi run looks like a fun print to add to the house. I love the Mosaic Stones Multi! Well, I love THIS rug for my daughter’s room, but it’s not on their site! I like “everyday life” for my living room. I love the Mixed Chevrons, PERFECT for a playroom, great choice!! I like the Anna’s Time Multi. Hopefully for our new basement! I like the one you chose! I really love the buffalo shag! I went and looked at the choices, and honestly my fave is the one you got. Our décor is very modern and bright/colorful. Eek! Just one!?! Not possible. I can definitely do a top 3 list! Simpatico- Biscuit/Starch, Soft Zebra- Cream Brown, and Everyday Life- Apple Butter/Pearl! Bangles Multi would be great in our dining room! I love the Cora Beige for our dining room! I love the Suzani Panel Multi for our living room. I love the Haight rug in Coco for my dining room. I also love how the chevron rug looks in your playroom! So cute! I have been shopping around for a rug for our living room to go under the ottoman but just haven’t found the one that calls out to me yet. Now that I see the Felicity zig zag from this website, I love it!! I’m planning our new nursery for baby #2 and LOVE your bright chevron rug. I want that one! I love the colors in the Mohawk Home Mosaic Stones. It might just work in the kids room we are creating. I love the beige or Taupe/Brown! 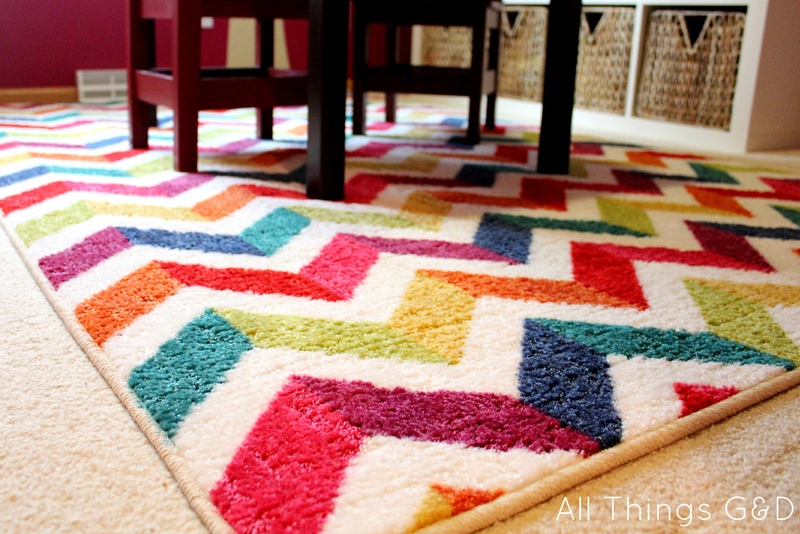 Love the zigzag rug – I would be so nervous with so many colors – but it was the PERFECT choice for your space! I love the one you chose, but the Anton is pretty groovy too. I just adore the Whinston Multi! I am still undecided, but generally I’m feeling any rug with bold, geometric designs! Simpatico would look fab in our living room! I actually love the one you have! It’d be so cute in my daughter’s room. I love the Tarkington Coco! It would go perfect in my living room. I like the Anton rug for our play room. I NEED the Lascala Chevron Stripe Medium Blue for my house! The Anton Natural would look great in our living room! That looks perfect D! This mama needs to furnish a new house, I would LOVE the Anton Natural! Love the Cora Beige rug for our kitchen! I think the “Mandarin Star Neutral” rug would go perfectly in my bedroom! I love the Becker Turquoise rug! It would go great in our new baby’s room. This was hard! I would like the mosaic stones multi. I want the West Bay – Oyster rug! Any of the chevron rugs would be so fun! I love the Simpatico – that would be perfect in the master bedroom redo I’m about to undertake! I’m loving chevrons right now so the Lascala blue chevron rug or even your adorable multi rug could easily find a place in my home! I just love the mixed chevron rug you chose. That would be my pick as well! I’d love the Anton rug for under my antique desk. I love the Yoruba Camden. I like the one you are using! I did not see it on the site! I could not work it right! i love the Montero Botanical Heather! I like the Peacock floral rug. I like the Simpatico Biscuit/Starch! Whinston Multi! I love the big pattern- I can use lots of colors & small patterns in pillows and accents without being too busy. And it’ll take the focus off my god-awful dark red couch (that is like heaven when you sit or lay on it) and I can paint the walls a pale turqoise… ahhh the design options! WHINSTON MULTI, PLEASE! i love the camden grid rug! Love Felicia – Cocoa Parline rug! colourful chevrons for the win! I love the mixed Chevron one you picked out!! It would work well in our nursery for our son or daughter!! Tough choice, but I think I would choose the Cora in Beige with the flowers. The Cora Beige is lovely! I love the lascala chevron stripe in medium blue! It would look great in our playroom! I love the Simpatico Biscuit/Starch rug and the Lascala Chevron Stripe Blue rug. Simple and beautiful! I’m boring…I like the Frise Shag rug. I want the one you want! It’s adorable! Love the mixed chevron as you have! I’m a fan of the Anton Natural one! Love the Bangles Multi rug! I like the Cora rug and the Chevron one you showed for Kate’s playroom! I love the one with the big blue flowers, but don’t see it in many sizes. It would be so hard to decide! love the Caravan Medallion Multi ! I love the rug! My fav from the website is the Anton Natural. the Mixed Chevrons is perfect! Love your rug! It works so well to tie those colors together. I actually just need a solid-colored rug for our living room, and they have so many options in colors that would work for us. Love the Anton natural and the one you have! Yoruba Camden would be perfect in my workspace. I like the river stone doormat, ours needs replaced right now. thanks for the giveaway! I really like the Yoruba Camden Oyster! Beautiful makeover, by the way. Mosaics Stones is fun and bright. Love love your mixed mosaic chevron and the zigging multi color! Love the Acanthia one – like the reds, tans and browns, would work great in our “media/tv” room. What color do you have on the walls? I tried to find this area on Mohawk’s website to buy it for my daughters playroom…but after searching on their site for far too long (LOL), I still wasn’t able to find it. Can u give me the exact name of the colorful Chevron rug you used for Kate’s playroom? Or perhaps the SKU number. Hi Ally, it’s their “Mixed Chevrons” rug. I know Target had it on their website for awhile. Try googling “Mohawk Mixed Chevrons” – hopefully it will come up for you! Hi! I was wondering how your activity table is holding up, as far as child wear and tear. My daughter just turned two, and I’d love to get her a table and chairs with some of her birthday money, but have read mixed reviews about a variety of tables having the finish scratch easily. I’ve been browsing Land of Nod, KidKraft, PB Kids and others. I’d love to know if it’s held, or I’m also considering buying an unfinished table that I can stain and seal myself so it’s easy to sand and refinish. Any feedback you have would be so appreciated! Great question, Kate! Our table has held up beautifully. Absolutely no nicks or scratches in it yet. We keep a sheet of craft paper over it most of the time, so that also helps, but the edges are still exposed and they look as good as the day we got it.